This Fritz Schnauzer is so adorably cute and fun to play with! Made by Douglas Cuddle Toy. This dog is so realistic that it will remind you of any Schnauzer you know in real life or the one that you always wanted to have! 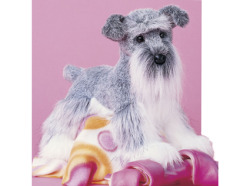 A great gift for all Schnauzer fans to enjoy! Made of long and short, soft "fur"